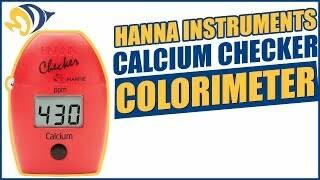 The Hanna Marine HI758 Calcium Checker® bridges the gap between simple chemical test kits and professional instrumentation, giving you accurate results for your saltwater aquarium in the palm of your hand. Many test kits on the market today rely the human eye to judge and determine color changes, which are notoriously difficult to use, especially in the lower ranges. Many professional instruments offer great accuracy using technology, but are not affordable to the average aquarist. 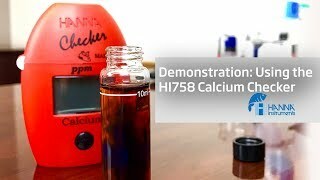 The Hanna Marine Calcium Checker® HI758 bridges the gap between simple chemical test kits and professional instrumentation, using a fixed wavelength LED and silicon photo detector to provide the accuracy of professional instrumentation at the affordable price of a chemical test kit. Calcium is an essential ingredient to a healthy and functional reef aquarium. Corals and coraline algae require calcium for calcification and growth, so much so that an aquarium stocked with these organisms require regular calcium supplements in order to maintain healthy levels. A variety of commercially available supplements exist, from calcium salts to buffered calcium supplements, which raise both calcium and alkalinity. Many aquarists set up a regular supplementation schedule to maintain proper calcium levels. However, regular calcium monitoring is crucial to a healthy reef aquarium, even if such a system is in place. This is because as corals and coraline algae grow and mature, their requirements for calcium tend to increase. As a result, the growth of the aquarium might outpace the calcium supplementation regimen. The ideal range for calcium in a healthy reef aquarium is between 380-450ppm. Values below 380ppm may slow the growth of corals, whereas high levels of calcium (>500ppm) puts the tank at risk for calcium carbonate precipitation (limestone formation). Press the button to power the meter on. Notice “Add C1” appears on the screen - you are now ready to begin testing. Using the 1mL syringe, add 1mL of reagent A to the cuvette. Then, using the dropper, fill the cuvette to the 10mL mark with deionized water. Distilled water is also acceptable. Once the reagent and water are added, invert the cuvette five times to mix. Press the button. 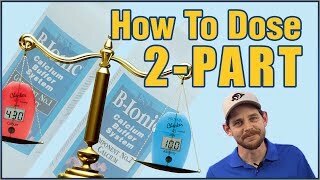 Once the screen shows "Add C2", remove the cuvette from the meter. Add 0.1mL of sample. For best accuracy, use the supplied 0.1mL pipette. Note: To use the Hanna Instruments Micropipette, first attach the pipette tip. Push the button to the first "stop", and then immerse the tip into the sample. Slowly release the button to its original position. Then, wait two seconds to catch any drops before dispensing the sample into the cuvette to the second "stop". Once the sample is added, add one packet of reagent B to the sample. After that, cap the cuvette and shake vigorously for 15 seconds. Wait 15 seconds for bubbles to dissipate. Wipe the cuvette of any oils and fingerprints, and place back into the meter. Press the button; The meter will directly display the concentration of calcium in ppm. At first I was hesitant to purchase because of mixed reviews I had seen, I bought it and don’t regret it. It beats trying to guess for colors. Best tester out there no doubt! Easy to use and read. I’ve tried other brands and Hanna Instruments products are among the better ones. I love the Hanna checkers for their accuracy. I hate having to guess between two colors or having to add 1ml of reagent one drop at a time to check a level. The Hannah checker is quick and easy and super accurate. Consistent results that match Red Sea test but only if steps are followed exactly. The process is rather long and you could test with red sea much faster but the digital readout is worth the extra time. Do not leave sample in cuvette for long periods or it will stain and affect future tests.